Canadians have long been concerned about the state of our air quality and the belief that air pollution is a major problem seems to be widespread. This publication examines the evolution of air quality in Canada from the 1970s onward and looks at how the current state of air quality compares to the stringent standards established by Canadian government policy. The conclusion is that air quality in Canada has improved substantially and that this significant change over the past four decades occurred at the same time there was considerable growth in Canada’s population, economic activity, energy use, and consumption of motor fuel. Using data from Environment Canada on emissions and ambient concentrations, the study provides accurate and up-to-date information on the status of five major air pollutants in Canada: ground level ozone, fine particulate matter, sulphur dioxide, nitrogen dioxide, and carbon monoxide. Comparing trends for the five air pollutants on three levels—national, city, and monitoring station—against existing national and international air-quality standards shows that air quality is improving for the most part and is now at levels generally deemed safe. Concentrations of ground-level ozone, a key component of smog, have generally decreased in Canada since 2000. In 2015, the national concentration of ground-level ozone was 27% lower than in 1979 and ozone concentrations have been consistently below the new stringent air-quality standard since 2005. Major Canadian cities have lower ozone concentrations than they had during the late 1970s. In the same period, over 70% of monitoring stations throughout Canada reported ozone concentrations that were above the air-quality standard; that number has fallen to 16% during the most recent interval. Concentrations of fine particulate matter in Canada have only been measured since 2000 and national ambient levels have consistently remained below the new air-quality standards. In the last four decades, concentrations of sulphur dioxide have fallen dramatically across Canada and have met the strictest annual air-quality standard since 1999. In 2015, ambient levels of sulphur dioxide in Canada were 92.3% lower than in 1974. Major Canadian cities also significantly reduced their ambient levels of sulphur dioxide during the same period. In the mid-to-late 1970s, over 60% of monitoring stations across Canada recorded concentrations out of compliance with the annual air-quality standard, but today only 3% of stations record non-conforming levels. 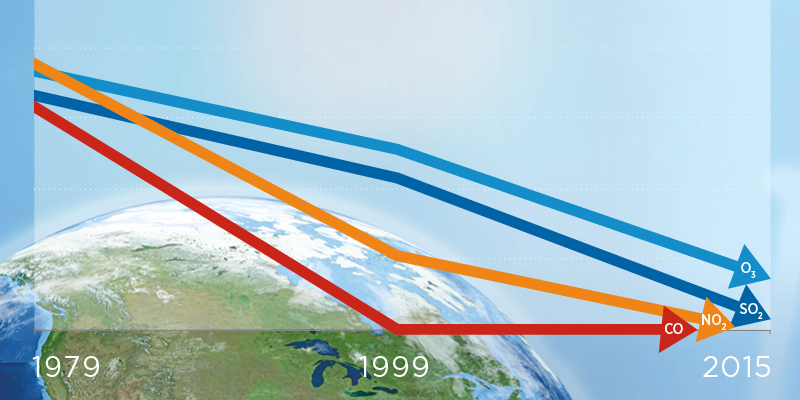 Concentrations of nitrogen dioxide have also been decreasing for decades in Canada. Ambient concentrations of nitrogen dioxide in Canada decreased 74.4% from 1974 to 2015 and ambient levels have been consistently below the strictest air-quality standard since 1985. The decrease in ambient levels was also apparent in all major Canadian cities. Whereas in the mid 1970s, 54% of stations across Canada reported readings out of compliance with the annual air-quality standard for nitrogen dioxide, in 2015 the percentage was zero. All monitoring stations throughout Canada have met the strictest annual air-quality standard for nitrogen dioxide since 2011. There has also been a substantial reduction in concentrations of carbon monoxide in Canada during the last four decades. Ambient levels fell 90.4% in Canada from 1974 to 2015 and have conformed to the strictest air-quality standard since 1985. Levels of carbon monoxide in major cities have also fallen dramatically over the past four decades. In mid-1970s, 84% of stations had readings for carbon monoxide exceeding the air-quality standards but, since 1999, all stations across Canada—with the exception of one in New Brunswick in 2011—recorded values conforming to the air-quality standard. Between 1970 and 2015, real gross domestic product increased by 242% and the Canadian population grew by 68%. From 1980 to 2015, consumption of motor fuel rose by 26% and from 1995 to 2015 energy use increased 21%. At the same time emissions and ambient levels of major air pollutants dropped significantly, indicating the extent to which air pollution has been decoupled from energy use and economic growth in Canada. For this reason, discussions about the need for new policies to tighten emission policies even further should begin with the recognition that air pollution has already substantially declined in Canada and is largely in compliance with some of the strictest standards in the world.